Double fudge Coca Cola cake? Yes please! Putting salted peanuts in your coke is a southern thing. No one really know how the practice started but it is brilliant – that perfect salty sweet taste with the added blast of fizz. Anyway, back in the 1970s it was a pretty cool thing to do, and being the cool person I was – I did it. I also put them in my beer but that is an entirely different story. Back then Coke and everything else was made with sugar and served up in thick, greenish glass bottles. I know it might sound stupid but I think that cokes of any sort taste best in glass bottles. The plastic just doesn’t do the job. You used to be able to walk into a little gas station or little corner store and grab a coke out of a bucket filled with crushed ice. The drink was so cold that when you opened it up there was slush on the top of it – and nothing tasted better on a 110 day than one of those cold cokes – with a bag of peanuts floating on the top. I think Coke tasted different back then. It was peppery and so full of fizz that the bubbles tickled when you took a swig. Although I worked quite a lot, whenever I got a Saturday off I headed for Kiest park, a local park where we all hung out. I had a 77 Monte Carlo with a T-top and cruising around in that was pure hotness and I don’t mean the temperature. Halter tops, cut-off shorts, Farrah Fawcett big hair, and Kissing Potion lip gloss in Cola flavor were standard items for these no-holds-barred weekend parties. I got started thinking about those days and realized I hadn’t had Coke and peanuts in decades. Then I started thinking about cake. This is what happened. Double fudge Coca Cola cake, Yes, I went there. 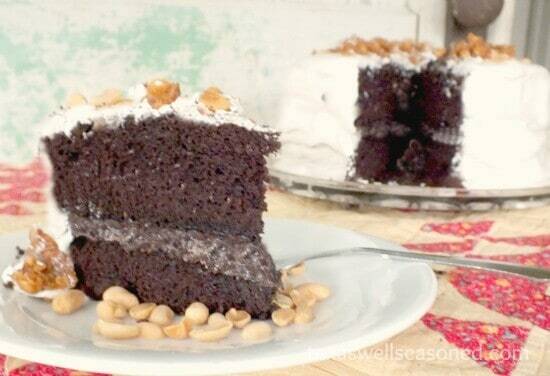 Oh my gosh, it is so chocolaty, moist, and addictive. You get the rich chocolate, the intense sweetness, and then the salt. Give this a try. It isn’t difficult to do. You can use either homemade peanut brittle or use some good quality brittle from the store. If you make it homemade add a sprinkle of salt crystals while it is cooling. This cake is moist and rich. The layers are brushed with Coca Cola when they are still warm. 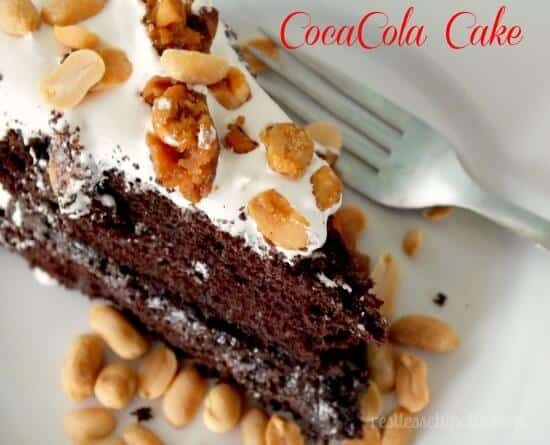 You make both a fudge filling and a marshmallow type frosting – both with cola flavor… No Coca Cola cake has much cola flavor but this one has more than most. I think you will enjoy it. And, the next time you pop the top of an ice cold “Co-Cola” pour ya in some salted peanuts. Moist, fudgy chocolate cake with a touch of cola flavor filled with a thick, rich chocolate and cola filling and then frosted with a light cloud of cola flavored marshmallow icing. Top it with crushed peanut brittle for a new twist on an old fashioned treat. Grease and flour two 9-inch round cake pans. Mix the flour, baking soda, salt, sugar and cocoa into the bowl of a stand mixer. Using low speed add the butter, buttermilk, and Coke. Mix for 2 minutes, scraping the sides of the bowl often. Add the egg and egg yolks and beat until well incorporated. Spoon the batter into the cake pans. Bake at 350 for 30 minutes or until cake tester comes out clean. Remove from oven and brush the tops quickly with Coca Cola - make them moist but don't soak them. Bring first 3 ingredients to a boil in a large saucepan over medium heat, stirring until butter melts. Remove from heat; whisk in sugar and vanilla. Beat until cool and thick. Combine all ingredients in top of double boiler. Cook over rapidly boiling water, beating continuously with a hand held electric mixer, until mixture will form peaks. Remove from heat, and continue beating until thick enough for spreading. Put a thick layer of filling between the two layers. Frost with the marshmallow frosting. Sprinkle the top with coarsely crushed peanut brittle. Do not make substitutions in this recipe. This is positively delightful. I love recipes that remind me of my childhood. Me too. I miss those days – a sure sign of getting old, right? this is dangerous! look delicious! 🙂 thanks. I love chocolate cake. coke and peanuts!!! I love this idea Marye… shared! I might just have to make this one. And then give it away because I would eat the whole thing! LOL! It really is good.